Welcome back to another edition of the State of the Galaxy. In this installment we’re going to cover some of the rewards and intricacies of our next major release, featuring Territory Battles. 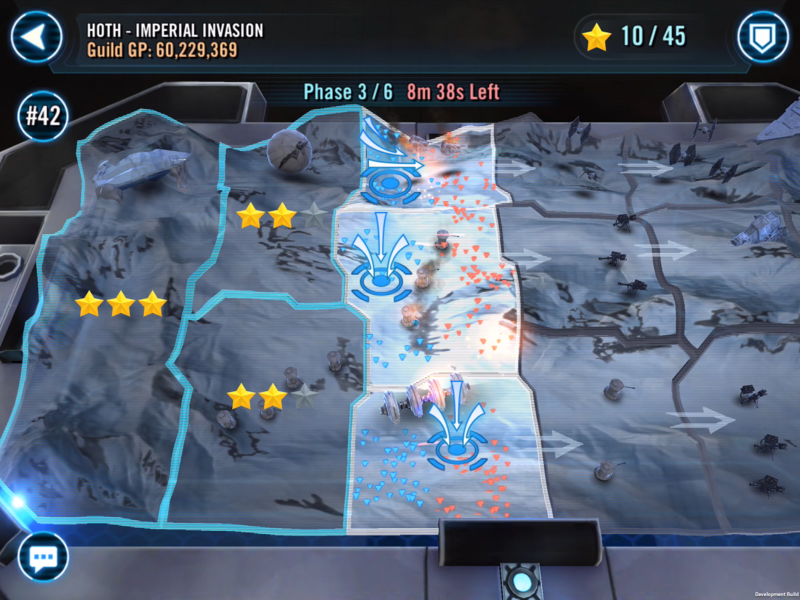 As many of you may be aware, we are super excited to share our newest feature, Territory Battles! This is an epic, multi-phase battle, pitting the entire collection of characters and ships of every guild member against a progressively challenging, living battlefield. Work collaboratively with your Guild to bring over 7,500 units (characters and ships) into battle. Participate in new gameplay like Platoon Missions, which unlock special abilities, such as the Ion Cannon, to turn the tide in your favor. Work together to grow your Guild and Collection to top the Leaderboards and show the world your true power! We have more information coming soon that will introduce more of the gameplay details and strategies in Territory Battles. In our Road Ahead blog post, we said that there were going to be some new characters brought to the Holotable in Territory Battles. We’re happy to announce that Captain Han Solo, Rebel Officer Leia Organa, and, finally, Hermit Yoda will be making their way into Galaxy of Heroes. Captain Han Solo is powerful Rebel healer and Rebel reviver. Rebel Officer Leia Organa is a devastating attacker, able to attack up to 10 times in a single turn! As for Hermit Yoda, his ability kit will remain shrouded in mystery, just like Yoda himself… for now. Captain Han Solo and Rebel Officer Leia Organa’s kits will be available this week for your review. We will let you know when we post them! To unlock Rebel Officer Leia Organa, you’ll need to use Captain Han Solo to participate in a Special Mission in Territory Battles. Your Guild’s teamwork is key because for every Guild member that completes this Special Mission, the Guild as a whole will earn an additional Character shard of Rebel Officer Leia Organa. 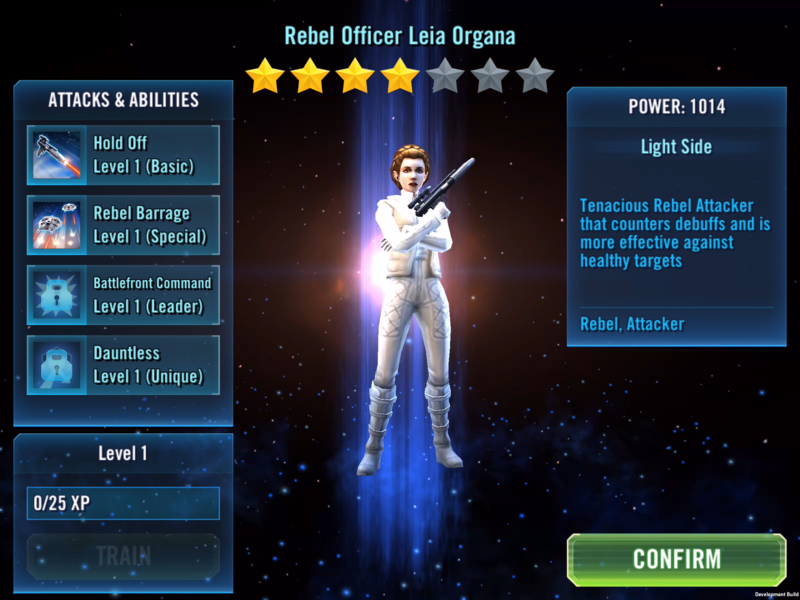 For example, if 20 members out of the 30 participating in a particular Territory Battle successfully complete her Special Mission, all 30 will receive 20 shards of Rebel Officer Leia Organa. And if all 50 members in a maximum-sized Guild participate and complete her Special Mission, they’ll each earn 50 of her shards. You’ll want to have these new, powerful Rebels at your command so that you can unlock another Special Mission, which accelerates the amount of Guild Event Tokens you earn. Guild Event Tokens can be spent on Hermit Yoda and other rewards in the brand new Guild Event Store. Take note, there is also a Special Mission that Commander Luke Skywalker unlocks, which also further accelerates your Guild Event Tokens acquisition. Make sure to collect all of these heroes of the Rebellion to empower your roster! Territory Battles also heralds the arrival of Gear Level XII. This new tier of Gear will bring a whole new level of Power to your units. This time around, the increase in Gear Level will not be related to an increase in Character Level, but rather to Character Star Level. You will need Seven Star characters to use Gear Level XII; Gear Level XII can be purchased in the Guild Event Store. The new gear is a significant increase in the amount of Power from Gear Level XI and also increases your overall Galactic Power with each piece. One other note about Territory Battle rewards is that every Guild member is important to earning the best rewards and all Guild Members earn equal rewards. Fight as a team, earn as a team. This is just a preview of what to expect with Territory Battles. There is so much more to share regarding gameplay, details, and strategies! We can’t wait for you to get your hands on it! Please keep your eyes on the forums in the coming weeks for more information. See you on the Holotables! Here is a listing of the Territory Battle exclusive Characters making their way to the Holotable soon. Once a Character kit is released on the forums, a handy dandy link will be provided below, leading you to the Character breakdown over in Squad and Character Strategy. Cheers!